Like a few weeks ago, France will see another day of massive protests all over the country on 10 September 2011 with around 100,000 bikers expected to bring the entire nation to a complete standstill. The angry bikers, called to protest by the Fédération Française des Motards en Colère (FFMC – French Federation of Angry Bikers), continue to oppose the compulsory wear of a high visibility fluorescent vest as a measure imposed by the French government to reduce the number of accidents involving motorcyclists. The bikers argue that the measure is a complete non-sense as accidents are largely caused by car drivers not watching out for motorcyclists on the roads and not being adequately trained to share the roads with them. The bikers also argue that the measure is proposed to enable the government to cash in thousands of euros a day from bikers who choose not to wear a high visibility jacket. The French government is accused of not being concerned about what bikers may wear underneath that high visibility vest for their own safety in case they fall off their bike. As long as they wear the fluorescent vest, that’s all what counts. 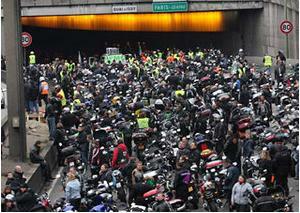 Will bikers turn up again like this on 10 September 2011? The government says that as long as you wear a high visibility vest, you're dressed appropriately for riding! Just after the massive demonstrations that took place on 18 June 2011 all over France and gathered almost 100,000 bikers, Michèle Merli, in charge of France’s road safety and working closely with Claude Guéant – current French interior minister, announced on national radio that there had been a misunderstanding with regards to the proposed requirement to wear a high visibility vest. It took just a couple of days for the French government to step in and advise that there had never been a question of imposing a high visibility jacket on the bikers but rather a “little strap” that they would be required to wear around their arms (as if these were enough to improve the visibility of motorcyclists and protect them from injuries in case of an accident). It was laughable to see how quickly the French government responded to the bikers following hugely embarrassing demonstrations which made the first page of the motorcycle press internationally. Claude Guéant, French interior minister, continues to treat motorcycles like cars by banning traffic filtering (lane splitting) and forcing all riders to remain stationary in traffic jams, as if they were driving cars. Not to mention Guéant’s proposal to force all bikers to change their registration plate for a bigger one, as if this had an impact on reducing the number of road accidents involving motorcyclists! The bikers are just fed up with being imposed ridiculous measures that are purely designed to cash in thousands of euros a day in fines from motorcyclists willing to use a mode of transport that guarantees zero congestion, considerably reduces pollution and offers a more affordable solution to those facing financial difficulties. 10 September 2011 will definitely not be a good day to visit France as enormous delays on all major roads nationwide will be caused by the angry bikers, who will bring the whole country to a complete standstill, like they did on 18 June 2011. Riders from the neighbouring United Kingdom who wish to join the demonstrations in France and support their French cousins can do so by disembarking in Calais and joining a protest group nearby (don’t forget to take with you your passport, motorcycle insurance certificate and licence). We will post further details nearer the time to enable UK riders to plan their trip to France. Thousands of high visibility vests took fire all over France at the last demonstrations on 18 June 2011. Will the angry bikers do this again on 10 September? bring it on to our Queennsland/Australian government…..Hell bent on powerand taxes….Anna..!!! bring it on, didn’t make the last demo, will be doing this one. anyone else travelling from the UK?